The biggest challenge of selling crafts online is getting your website found. In a cyber world inundated with craft products how can you get people to find your site? In Part 2 of this three part series I hope to shed some light on how you can increase traffic to your website just by tweaking the keywords you use in your photos, product titles and product descriptions. In this article I will cover some keyword comparisons and how to get smart with your keyword selections. Although the examples I will give are all jewelry keywords you can take the same principal and apply them to selling crafts online. 3) PRODUCT DESCRIPTION - Weave in your important keyword into your product description. As your description will likely be short just select a couple of keywords for this area. Cramming too many keywords in will not help your site traffic and may in fact damage your position in the search engines. First off let's look at the most obvious keyword comparison for those of you selling jewelry online. Keep in mind that "jewelry" is one of those words that has two different spellings. If you live in Canada you will likely spell it as "jewellery" and in the US it will be "jewelry." Make sure to research your keywords for both, especially if you live in Canada. While one spelling may turn up a high level of searches, the other may turn up less competition. You can decide which spelling will benefit you the most. Even if you are attached to the Canadian spelling you may want to reconsider if it will bring in more traffic. Remember if you are selling crafts online you can use the examples below to get the gears rolling on how to find keywords for your particular product. Like selling jewelry, selling crafts online will return a whole set of interesting results for high traffic keywords once you start asking the right questions. ONE - "Dragonfly brooch" potentially brings in 70% more traffic than "dragonfly pin." TWO - Although there are more than 3 times as many searches online for "flower earrings" than for "floral earrings", there are almost 7 times as many "flower earrings" to be found online. "Floral earrings" would likely bring in TWICE as much traffic than "flower earrings." THREE - If you are selling a rose ring you can potentially get more traffic using "rose ring" than you would if you use the keyword "flower ring." Although there are almost 60% more searches for "flower ring" there are almost 4 times as many "flower ring" results online than there are for the keyword "rose ring." Therefor "rose ring" could potentially return 2.5 times more traffic. 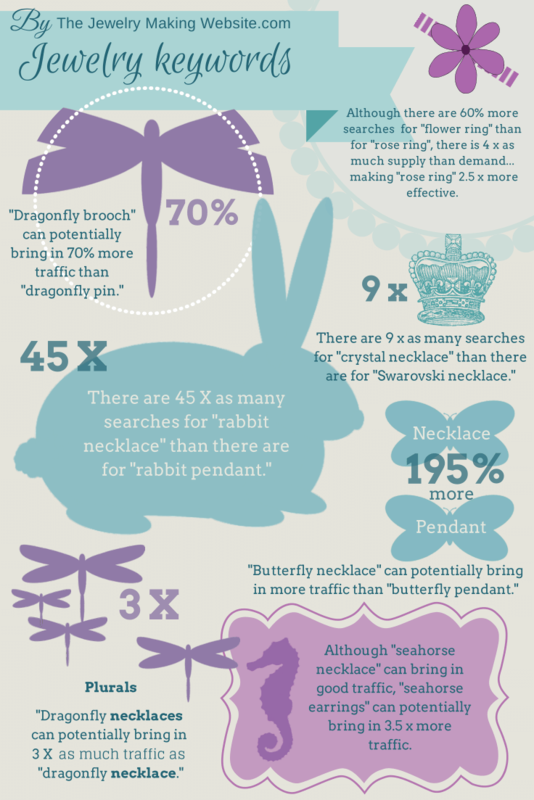 FOUR - There are 45 times as many people searching for "rabbit necklace" than there are people searching for "rabbit pendant." You could potentially have 4700% more traffic with the use of "rabbit necklace" as your keyword. By the same token "rabbit necklace" is a much more highly searched keyword than "bunny necklace" by as much as 47 times the searches. FIVE - Do plurals make a difference? Yes. There are 6 times as many people searching for "costume jewelry brooches" than there are searching "costume jewelry brooch." There are roughly the same number of costume jewelry brooches in the results online as there are costume jewelry brooch, however the plural will attract more than 6 times the traffic. SIX - In the case of "dragonfly necklaces" verses "dragonfly necklace", although the plural has one tenth in terms of searches it has the potential of attracting 3 times the traffic. While you will likely title your product and your product description with the singular version, you could certainly label your photo with the plural. SEVEN - There are 9 times as many people searching for a "crystal necklace" as there are searching for a "Swarovski necklace." Even if your necklace is made with Swarovski crystal you may get almost 80% more traffic by labelling your image with the keyword "crystal necklace." EIGHT - "Butterfly Necklace" can potentially bring in twice as much traffic than "butterfly pendant." NINE - Although "seahorse necklace" can bring in good traffic, seahorse earrings will potentially bring in 3.5 times more traffic. 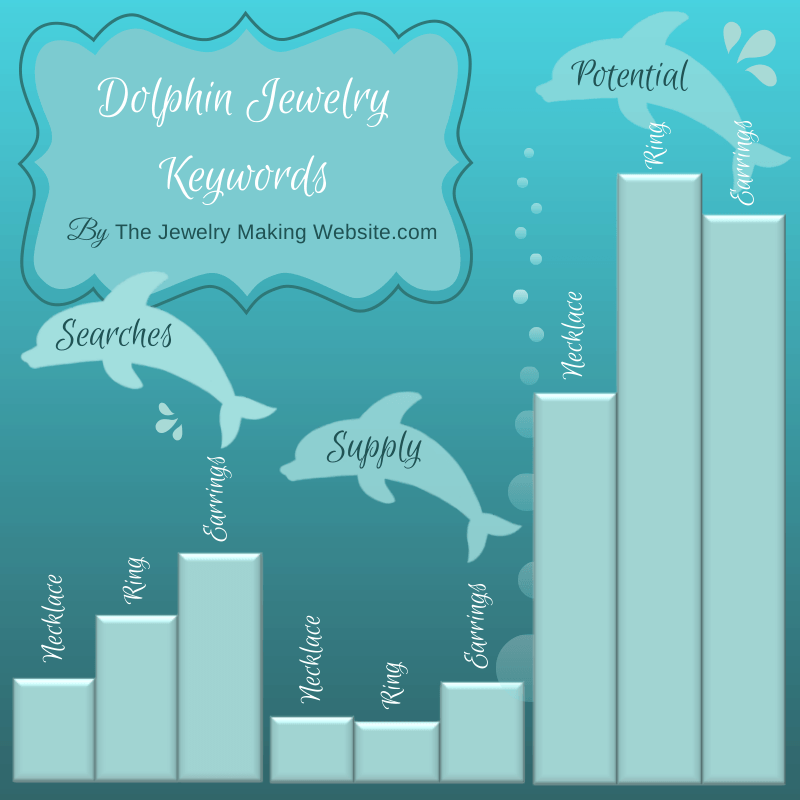 TEN - "Dolphin ring" brings in more traffic than "dolphin earrings", even though there are more searches for "dolphin earrings" than there are for a "dolphin ring." This is because there is much less supply than demand for dolphin rings. To find keywords that will help you get traffic I recommend that you regularly research as supply and demand changes all the time. Although there may be more people online searching for a zipper necklace, the internet may become inundated with zipper necklaces. This makes it more unlikely to be found on Google Images using that term. To give a good example of keywords for selling crafts online we can compare butterfly and dragonfly keywords. There are more than ten times the searches for "butterfly decorations" as there are for "dragonfly decorations." There are marginally more searches for "dragonfly wall art" than "butterfly wall art". However, the supply competition is more than double for butterfly, making "dragonfly wall art" potentially two and a half times more effective. Please check out Part 3 of this keyword article series for more details on using highly searched plural keywords. Return from Selling Crafts Online to How to Sell Jewelry Online.